1) Reduce the express shipping rate from $20 to $9 per shipment. The more item you buy in one order, the more shipping fee that you can save. 2) Set the express shipping rate ($9) as default in the shopping cart. 3) It applies to items include battery because only selected express shipping companies allow carrying battery in the parcel. For items that do not include battery, buyer can also select to add $9 to use express shipping to receive your order in a faster way. 4) Give you more options. For some phone sets without batteries, if you do not need express shipping and can accept the standard shipping time schedule, you can even save the default $9 shipping fee for express. 1) Registered Mail (phones and accessories without battery) : FREE of charge by deduct/Offset. 2) any purchase received is significantly different from what was described. We sell only Genuine and Original mobile phones! These phones could be brand new, refurbished or used, but they are all originally from their respected manufacturer! For some stockout original accessories, we will use branded replacement. We don't sell fake ! We are selling real stock, not product catalog. Therefore we show you actual photo of the products we are selling. These photos are taken by us, showing you what you see is what you are going to get. We offer free shipment worldwide (or DHL/TNT/EMS upgrade options) and the price on each product is the final price to pay. There is no hidden charge or extra cost when you checkout the shopping cart. All mobile phones and valuable accessories we send will have tracking number and handled by the Hong Kong Post, one of the Paypal approved shipping companies. We will update our customers with tracking numbers immediately after posting. If by any chance, you are not happy with your purchase, you can return it within 7 days and have your money back. All our phones come with 6 to 12 month service warranty, excluding parts and damages by water or human errors. 6 months warranty for refurbished phones and 12 months warranty for brand new phones. If there is any problem with your phones, no worry, please contact us and return it for fixing or replacing with the warranty paper. We provide 3 months warranty for battery only. We usually run battery health test by a full charge and full discharge cycle before shipping (except retail packed batteries). Since these vintage batteries have been stored in warehouse for more than 10 years, battery life declines naturally. We can only promise 24 hours battery standby time. For some special case, like the battery for Nokia 8110, we will clearly specify that the battery is good enough to switch on the phone and make one or two calls only. Please read our listing carefully. Started selling in eBay from year 2004, we got excellent customers' feedbacks. With much experience selling mobile phones online, we had already built up a matured shipping system and after-sales customer care system. We are a verified business account member of PayPal, having credible trade records in PayPal. We are serious and genuine seller providing services that are exceeding the requirement of PayPal on sellers. We are the biggest supplier in our region for these good old mobile phones. We distribute our phones to professional resellers worldwide. That means, we can ensure you to get the best quality phone with lowest price. IMA-Shop is one of the members of IMA Group which diversifies investment in telecommunication and computer technology. The Group provides a strong back-up to the successful operation of the online shop. We are selling brand new, new, used and refurbished phones. We will clearly indicate on our listing that the condition of the phone. Buyers is strongly advice to read and understand what phone condition that you are buying. We are also selling accessories and tools, and they are all brand new. The phone is brand new and originally boxed. The box and packing may be opened for unlock and inspection. Other than inspection and unlock, the phone is brand new and unused! The phone is previously owned and used. The phone will be cleaned and fully checked before we sell it. (1) What are Refurbished Products? * is repackaged (including appropriate power charger, cables, etc.). (2) What should I expect when I purchase Refurbished Product? (3) Any limitation will be applied to these Refurbished Products? * Normally, we will try our best to provide original and brand new battery and wall-charger. But, some refurbished phones we are selling are very rare and old. There is no more new original battery and/or charger available. The best we can do is providing good quality replacement accessories. * Some replacement battery may not as good as original one and will last for 1-2 days! FYI, my brand new iPhone battery last for 1 day only! If you are looking for a phone with 10-100 days battery life, please DO NOT buy! * We will clearly indicate in our listing that what accessories we are providing. Free feel to contact us to clarify before buying. * All refurbished phones do not come with hard copy user manual. Please contact us for soft copy download and help to save trees for our planet. We provide 3 months warranty for battery only. We usually run battery health test by a full charge and full discharge cycle before shipping (except retail packed batteries). Since these vintage batteries have been stored in warehouse for more than 10 years, battery life declines naturally. We can only promise 24 hours battery standby time. For some special case, like the battery for Nokia 8110, we will clearly specify that the battery is good enough to switch on the phone and make one or two calls only. Please read our listing carefully. We accept Paypal and credit card / debit card / eCheque payment through Paypal. For security details, please see our privacy statement. Payments by eCheque through Paypal may take up to 10 working days to clear in full, after which we will process your order and dispatch your goods. Payers MUST be the holders of Paypal accounts and aged above 18. Any orders placed by those aged under 18 must be with the consent of a parent or carer. Any information given by the child must be with the consent of a parent or carer. The card holder must be available to give information in cases where an under 18 is ordering. Hong Kong has no sales tax. All of our prices are tax-free. The price has included the shipment cost including labor, transportation, packing materials and postage. We try to have accurate pricing and availability information on all the products we offer; despite our best efforts, a small number of the products in our catalogue may be mispriced or have inaccurate stock availability information. We do verify prices as part of our acceptance procedure, and will inform you if a product's correct price is higher than that stated in your order, so you may ultimately decide whether or not to order the product at the correct price. We may change the price of any product at any time before you place an order. If the goods you have ordered are not in stock, we may send an e-mail to inform you, at which time you may cancel your order. We do our best to accurately estimate when items will be despatched and/or delivered; however, these estimates are based on several factors over which we have no control and as such, time for despatch and/or delivery shall not be of the essence of the contract and should be considered as rough estimates only. 1. Import duties, taxes and charges requested by buyer's Custom Office are not included in the item price or shipping charges. These charges are the buyer's responsibility. 3. These charges are normally collected by the delivering freight (shipping) company or when you pick the item up. Do not confuse them for additional shipping charges from us. You can cancel your contract with ima-shop within 24 hours of days of payment. You should inform ima-shop in writing by email, quoting your payment transaction number and receive our confirmation on acknowledging your request woth code of acknowledgment. If your order is in transit or you have already taken receipt of it, then to cancel this contract you must contact us, quoting your purchase information, obtain a reference number from us and return the unwanted item/s together with the reference number provided to our address. You are responsible for returning the goods in a re-saleable condition at your own cost unless the goods are faulty or mis-described. Please review the Returns Policy detailed below. The goods must not have been used, must be complete with all components and the packaging must be not be damaged. Note that if these conditions are not met we may not accept returned goods; You will be credited for the goods within 3 days of accepting the return of package for cancellation. 1. If you have not received your order within 30 working days of despatch (not including Sundays), you must immediately advise ima-shop Customer Services of the delay/loss. 2. In the event of a replacement order being sent to you, all replacement item/s will be sent to you followed by a non-delivery declaration form which you will need to complete and return. 3. Where a refund is requested, the non-delivery declaration form must be returned complete before a refund can be authorised. 4. The declaration form will be sent to the email address supplied with the initial order, and on receipt; requires completion in full and returned to the email address supplied with the form. 5. Should the completed non-delivery declaration form not be received within 10 working days of receipt, then you will become liable for the cost of the initial goods and postage. * Where a replacement has been requested and dispatched, this will be charged to the method of payment for your order if a replacement has already been dispatched. * Where a refund has been requested and the form has not been received in the given time, then the refund will not be processed. 6. This charge will be refunded upon receipt of the completed non-delivery declaration form if received within 20 working days from the date of receipt for the non-delivery declaration from. Forms received between the 11th and 20th working day will incur a 20% administration fee of the value of the lost parcel and will be charged to the method of payment for your order. Any form returned after this period will be deemed void. 7. Duplicate forms are always available if you request by email to us. If your goods are faulty on arrival, you have 7 calendar days in which to inform us of the fault and return to us in original packing and condition for exchange or refund in full. First contact us about the item(s) and problem(s) with as much as detail as possible, quoting the address that you used to receive the products from us. We will reply you with a return reference number. To ensure your return is processed without delay, please ensure you include the Returns Reference Number provided with the warranty paper (applicable on mobile phones). Check that all returns are securely wrapped and packaged. We recommend using a postal service that provides proof of delivery and has compensation insurance for lost or damaged goods as returns are NOT our responsibility until they arrive back to us. Goods should be returned in their original packaging complete with all accessories and documentation. Once we have verified the fault, we will issue an exchamge or a full refund to you via your original payment method. We test returned items, and if our technicians find a returned item is not faulty or has been tampered with, we will return the item to you. In this instance you will be liable for the return shipping costs. You can return unwanted goods within 7 calendar days of delivery and we will refund you the price paid for the goods only. You are also responsible for return shipping costs. First contact us about the item(s), quoting the address that you used to receive the products from us. We will reply you with a return reference number. To ensure your return is processed without delay, please ensure you include the Returns Reference Number provided with the warranty paper (applicable on mobile phones). Check that all returns are securely wrapped and packaged. If you return a product to us that is not received in a brand new condition we reserve the right to return the product to you, or charge you a re-stocking fee (can be up to 50% of the total price). Unfortunately we cannot refund, replace, or exchange certain products if the seal/packaging has been broken or opened. This is applicable to all types of phones, accessories and products with sealed retail packing. For example: retail packing batteries. Where applicable, replacement or alternative items will be processed as promptly as possible, but please be aware that it may take up to 10 working days to issue the item. If an item is out of stock, we will contact you immediately. It will then become a priority back order to be shipped once stock is available. If you are eligible for a refund, we will refund you back to the payment method you used when you originally paid for your order. Please note: It is your responsibility to notify us of any changes to your payment account i.e. you no longer have that account. Refunds can take up to 30 days to process. Refunds by credit card (through Paypal) are made to the same credit card that was used for the original purchase. In this instance you will be liable for the return carriage. Any return that is not accompanied with the returns reference number will be threaded as low priority and long process time. Please write your name and address clearly on the package. Parcels with undefined sender information and have not been reclaimed by you within this period will be disposed of after this time and will result in the return being completed without action. Item returned after the warranty expired cannot be accepted. * The phone or memory card contains personal data such as photos, contacts or any other downloaded content such as ringtones, games etc. In instances whereby Personal Data cannot be removed from the handset using the manufacturer's reset functions or the seal of the included licensed software has been broken, your handset will be returned to you at USD25 as standard postage. For repairs/replacements service, buyer shall responsible for all shipping costs. For repairs/replacements service, please provide clear and sufficient information about the order shipment address and name of buyer for our information. Reasons for return must be stated clearly and as much as you can in details. Please ensure that the handset is securely wrapped and packaged. Do not send any accessories including the battery and battery cover except in cases when the fault is a power/charging fault then send the battery and the charger. Please contact us first with details and we will give you suggestions about what items to return for service. We recommend using a posting method that provides proof of delivery and can compensate for lost or damaged goods for higher value items. We cannot be held responsible for any units that have been damaged in transit. It is imperative that all sim/memory cards are removed from handsets. Cards must not be returned with the handset and we cannot accept any responsibility for cards, credit on pre-pay cards. If we do receive a sim/memory card it will be disposed of on site for security reasons. Please be aware that part of the test procedure may include upgrading the software on your phone. If the memory is cleared and reset as part of the repair process, ima-shop cannot be held responsible for any numbers or data lost. A copy of the proof of purchase must accompany the phone to validate the warranty. Failure to do so may delay the turnaround time of your repair. This can be the warranty paper that come with the phone or a copy of your original invoice that was dispatched with the handset. If the unit is in warranty the engineer will repair or replace the phone depending on the manufacturer's procedure. Physical or liquid damage is not covered by manufacturer's warranty and is subject to either a charge for repair which will be quoted prior to action being taken. All mobile phones bought in ima-shop carry a six (6) to twelve (12) months warranty and battery for three (3) months from ima-shop. If your faulty item is not covered by being outside of the warranty period or damage that is not covered, then please refer to the Charges section below. Should the fault/damage on your handset be deemed as not being covered under the warranty, then we will inform you by email as to the cost to repair the handset. Handsets which are deemed as beyond economical repair may not be repairable and will incur an administrative fee of USD25.00 for it to be returned in the condition it was sent. Should you accept the repair charge, then ima-shop must be informed within 10 working days from the date of receipt for the repair cost. Failure to inform or notify ima-shop of acceptance of the charge within this time period will result in your handset being returned to yourself un-repaired and will incur an administrative fee of USD25.00. On occasions parcels identified as "Failed Delivery" are returned to ima-shop. Where any of the above reasons is applicable to your order then you will be informed of the failed delivery attempt by email and if required, a request for delivery address or confirmation of delivery details that you originally provided when first placing your order. Cost of the re-delivery will be charged to you and your order will be dispatched within 48-72 hours from notification, unless ima-shop receives alternative instructions. Cost of the re-delivery will be charged to you and your order will be dispatched following confirmation of the delivery address details. No action will be taken by ima-shop until new instructions are received from you. If after 30 days from the original dispatch date you have not contacted ima-shop then your order will be disposed of and a recycling charge made to your account. * In the event the delivery address needs to be amended, please contact us using our website or email to us at contact@ima-shop.com within 48 hours after ordering. * Re-delivery will be charged at the appropriate rate for the original delivery service chosen when the order was placed. * Recycling charges will be applicable to the product/s requiring recycling. The compliance of product to your sim card type, network coverage, car cradle, handset, power voltage, should be checked with your service providers or product suppliers before you place the order with ima-shop. We are not responsible for any mistake happened in compliance because buyers do not check before buy. The following applies to any information you provide to us, for example during any registration or ordering process. * You authorise us to use, store or otherwise process any personal information which relates to and identifies you, including but not limited to your name, email address, telephone number and address, to the extent reasonably necessary to fulfill your order, market/communicate products and services and deal with any enquiries relating to the same whether by us, our partners, successors (including the purchaser of the whole or part of our business), associates or sub-contractors (together our 'Partner Companies'). If you would like to request information or review or modify any part of your personal information then you should e-mail us at contact@ima-shop.com. By completing and submitting the electronic order form you are agreeing to these Terms and Conditions and are making an offer to purchase goods from ima-shop. Our acceptance to your offer will only be considered complete at the time we send the despatch confirmation e-mail to you, or when the goods you ordered are effectively despatched, whichever happens first. If for any reason your order is rejected before we accept your offer and payment has been taken, a full refund will be made immediately. Any goods on the same order which we have not confirmed in the despatch confirmation e-mail and that have not been despatched to you do not form part of the binding contract between you and ima-shop. 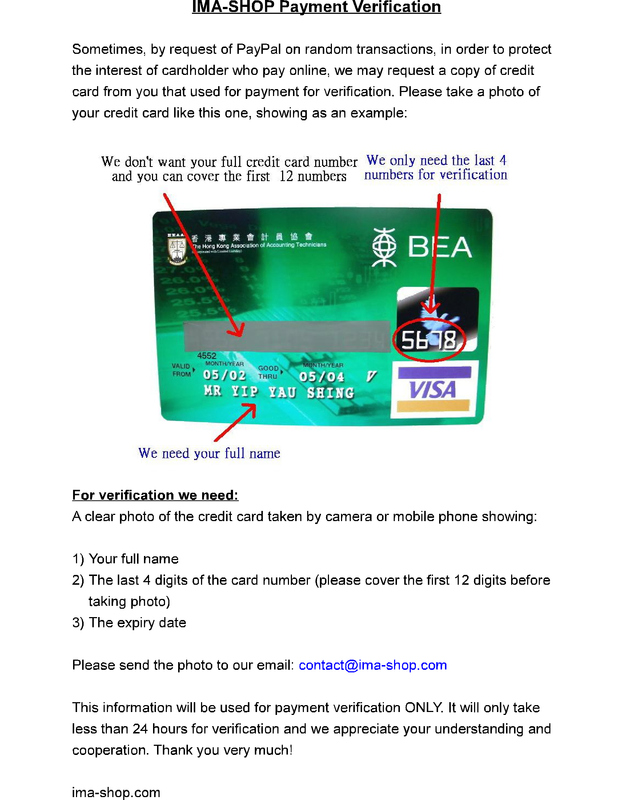 ima-shop will not tolerate any attempts to obtain goods by fraudulent means. Any fraudulent action will be reported to the relevant authorities. Please note that Internet host IP addresses are recorded when placing an order online. Q1. Are you selling genuine and original phones? Are they replica? Answer: We have been selling vintage phones for more than 10 years and have thousands of positive feedbacks on eBay. Most of our customers are vintage phone collectors and resellers from worldwide. Do you think we can fool these professionals with replica for more than 10 years? Also, if people can make iPhone 6 replica nowadays, who will spend million of dollars to replicate those outdated vintage phones models and sell 2 or 3 sets per month? Please consult someone with knowledge of BOM (Built of Materials) and they will tell you that it is a stupid idea to replicate old phones. Q2. Are you selling genuine and original phones? Are they replica? Answer: No, they are not replica !!! We only sell genuine and original items in our shop! Collecting this wide range of vintage phone models spends much less time and money than setting up thousands production lines to replicate these outdated models. It doesn't make sense to replicate instead of collect vintage phones. Q3. Are you selling genuine and original phones? Are they replica? Answer: Our shipping office locates in Hong Kong as it is a tax FREE on import and export. Hong Kong is geographically closed to China but it doesnot mean that we are selling the same quality that you may perceive on Chinese products. Q4. Are you selling genuine and original phones? Are they replica? Answer: We have repeated more than enough, and if the above points still cannot convince you, please try other sellers. But, we are confident that we are your only choice, because we are the largest and most reputable vintage phones seller that you can find! Q5. I do not have Paypal account. Can I buy with credit card ? Answer: You can pay with credit card through Paypal even you do not have a Paypal account. Please refer to the ima-shop user manual. Q6. I have paid the order in full already. Why do I still need to pay a bill when I am informed to sign for the parcel ? Answer: Unlike Hong Kong, most of the countries have import tax on incoming parcels. This is not payment for our shop, nor the shipping company but it is payment to your government as a kind of import tax / VAT. Buyers are liable to pay import tax, if any. Q7. When you said the phone is brand new, is it really brand new? Answer: Yes, we meant it. Also, according to the Trade Descriptions Ordinance, we have to clearly define brand new, used or refurbished on our descriptions. Q8. For those brand new phones with the original box, is it factory sealed? Answer: No, all the boxes are opened. Because most of our phones are from Europe and normally locked to their network providers. We have to unlock it and change the language (if available) before selling them to our customers. Most important is, these phones have been kept for more than 10 years and we have to check the condition, especially the battery performance. In short, we do not want you to receive a locked phone with a dead battery. In some cases, if the original box is not designed for overseas transportation, then we have to add more bubble films into the box to protect the phone, so the original packing may be slightly altered. Q9. Is the original box and packing materials perfectly brand new? Answer: No, they may not. Most of these vintages phones have been stored in the warehouse for more than 10 years, plus some transportations, so the box may not perfectly new. But, we can ensure you that unless specified, the phone and accessories inside the box is perfectly new. All images on this site are reproduced with a view to portraying our products as accurately as possible. Please be aware that designs may vary slightly, from those shown, due to normal design and production fluctuations.